ZAMBOANGA CITY -- A military official reminded the officers and personnel of the Army’s newly-activated 97th Infantry Battalion to be soldiers of peace and security by "guarding the welfare of the people." Maj. Gen. Roseller Murillo, the Army’s First Infantry Division commander, issued the reminder as he led the send-off ceremony on Monday of the youngest battalion, which coincided with the closing ceremony of the unit’s organizational training. The division's newest battalion has been assigned to augment the 102nd Infantry Brigade here in the Zamboanga Peninsula. “Always be culturally-sensitive and respectful to all our stakeholders in your new area of responsibility. 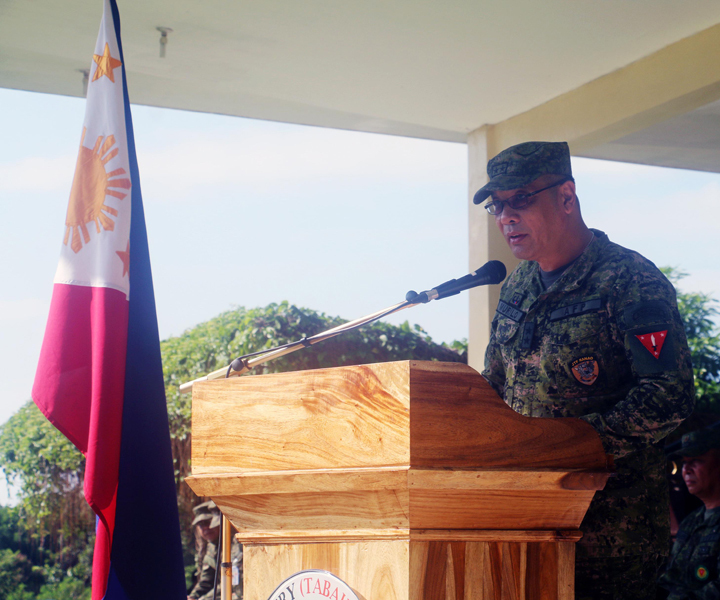 Also, be disciplined and responsible soldier who is always cautious in his actions so that we may continue to sustain the gains that we have achieved in the pursuit of our mission”, Murillo told the troops. Led by Lt. Col. Rufino de Leon, the 97th Infantry Battalion is composed of 485 strong and proficient officers and enlisted personnel. The battalion has completed on Monday its organizational training designed to significantly complement the counter-insurgency efforts of the Armed Forces of the Philippines (AFP), as well as the anti-illegal drugs and anti-private armed groups (PAGs) operations of other government agencies. Maj. Ronald Suscano, Army’s 1st Infantry Division information officer, said the battalion was formally activated last April 10 pursuant to General Orders Number 211 dated March 24, 2018.